For most of Hoboken, the challenges will continue with power out in most of town even with most streets now passable and many people opting to move to surrounding areas. Mayor Zimmer said evacuations took place all day yesterday but had no exact figure although one report placed it in the hundreds with those having medical requirements the first priority. The mayor toured the areas most challenged early yesterday with the National Guard and an exact count on those evacuated isn't available but it may be in the high three digits. According to an interview with the BBC, Councilman Dave Mello indicated the National Guard had been through his southwestern corner a half dozen times in the day taking people out who wished to leave and handing out supplies. 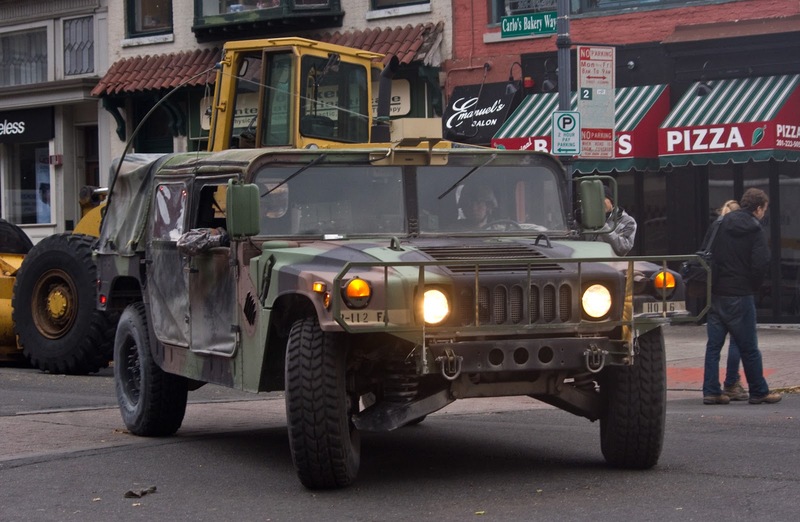 Hoboken is challenged as the region with fuel according the mayor who issued a call for residents not to drive and conserve fuel for the National Guard's local operations. She also asked residents not to drive in town where possible and especially at night since traffic lights are not working. One of the many National Guard vehicles on the job at City Hall yesterday. Entry points on the north have been passable but there's word unconfirmed Observer Highway is now too. While cars can not traverse the southern point between Hoboken and Jersey City, others can and access ATMs, Target, etc. Restrictions on entering the City by car continue with residents, emergency supplies and those working for businesses permitted in but an unconfirmed report earlier today said law enforcement was allowing people to drive in. MSV will look to confirm either way. The City is asking for supplies and volunteers with the growing needs from an emergency where power may be out for the next week. Midtown is far improved. Marshall Street downtown is now clear. The county appears to have delivered on a pump that went online in the corner of the southwest in the fourth ward since 2:00 am. There is plenty of water at the intersections of Patterson Plank, 1st and Marshall and vicinity. There's 880 units in the HHA, one of the most challenging areas for flooding and supplies will continue to be delivered into those locations. The 126 Bus on Washington Street is confirmed running but rumored only to 19th Street not into Manhattan. Ferries may remain on limited schedule. A panoramic view of the crowd awaiting Mayor Zimmer at Hoboken City Hall yesterday. Talking Ed Note: People continue to ask when power will be back and it's in the hands of PSE&G. The estimate of 7 -10 days is not anything exact but they must dry all the transformers on the west side and then get them stared up again. Hoboken Power Station Row - a series of power strips have been made available on Hudson Street from 4th to 11th. Starting with Sts Peter and Paul Church and up mostly all on the western side of the block, residents have created power stations for people, many with snacks and coffee. Duracell reported to be setting up soon at 3rd and Washington Street to hand out some energy supplies.